Do consumers prefer the ease of an EXE installer or the transparency of a ZIP file? For all the various add-ins available from my website, I have supported two downloadable formats, an EXE and a ZIP file. The EXE is easier to install and includes an uninstall capability. The ZIP hopefully provides the consumer greater transparency and control over what is on their computer. In addition to the software downloadable from my website, I also develop custom solutions through my consulting work. Most of my projects are sponsored by senior executives in companies or otherwise people with substantial decision making authority. It turns out that even a Managing Director or an Executive Vice President is subject to the automated IT protocols in effect in their organization (e.g., Group Policy). Small and midsize companies are more tolerant of the kinds of files their employees can download. So, it is my larger clients who prefer — actually, require — a solution acceptable to their respective corporate IT filters. That means no EXE and no MSI, not even inside a ZIP file. That has been a major stumbling block in my migration to .Net. For all the advantage of the platform, providing an add-in inside a ZIP file is not one of them. I wondered if that inability (or reluctance) to download an EXE extended to those who download software from my website. Using Google Analytics I decided to check their download preference/requirement. Would the data indicate a strong preference for EXE over ZIP or the other way around? Turns out the result is decidedly mixed! 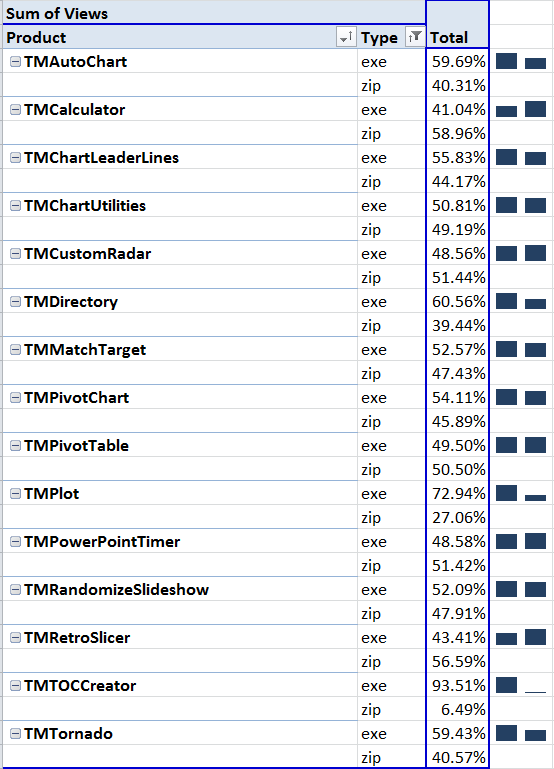 As the table below shows, with the exception of TM Plot and TM TOCCreator, the download choice is about 50-50! The table below is a PivotTable based on Google Analytics data for my website. For each add-in the table lists the EXE and the ZIP download percentages together with a sparkline for the two formats. I’ll almost never run an exe-installer unless it’s from a major player. The fact the results are indeed decidely mixed. 2) what will it really do? 3) can I afford to take the risk? re: the comment on .NET, first, I agree – .NET deployment is a much bigger deal than simply distributing some VBA code. Provides a very interesting option (and free, too!) when you want some .NET, but not the deployment hassles. I rarely visit DDoE, mainly because of the lack of discussions about Excel’s environment and major different platforms. So this comment comes late, very late. I recall You having an ironic laugh about .NET last time we had a conversation here. It’s interesting to see that even You seems to have a major interest in .NET. Funny, how things can change, right? Actually, it’s rather easy to make set ups for .NET/VSTO add-ins solutions. One great option is WiX, the same software that Microsoft use. Once You know the path around it and the required settings for the solutions then it’s quite nice and easy to do. What is a must today, all files should be signed with a digital certificate showing who is the vendor and also make the file(s) more trustworthy. Getting a certificare is quite easy if You select the right vendor. I welcome You to the wonderful .NET world and I hope You can accept this time the overhead the Framework .NET actually cause. Dennis, You have the wrong idea about me…and I suspect about others too but I’ll restrict my comments to myself. I have been using .Net from the very first release of the product. My reluctance to embrace .Net and every tweak introduced with each release reflects informed decisions and business imperatives. Over the years I have tried out a wide range of technologies, from Microsoft and from others. I have adopted some, discarded others, and delayed decisions on yet others. My emphasis is on providing the best possible solutions to real problems and not simply worshiping at the altar of the latest technology.